Harano K, Sasaki K, Nagao T (2005) Depression of brain dopamine and its metabolite after mating in European honeybee (Apis mellifera) queens. Naturwissenschaften 92: 310-313. 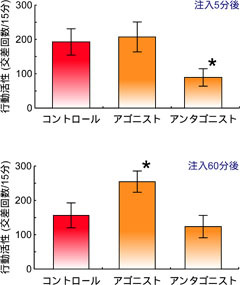 Harano K, Sasaki M, Nagao T, Sasaki K (2008) Dopamine influences locomotor activitiy in honeybee queens: implications for a behavioural change after mating. Physiol Entomol 33: 395-399. 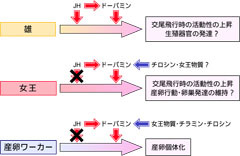 Sasaki K, Nagao T (2001) Distribution and levels of dopamine and its metabolites in brains of reproductive workers in honeybees. J Insect Physiol 47: 1205-1216. 佐々木 謙 (2010) 社会性昆虫における繁殖制御の生理・分子メカニズム. 比較生理生化学 27: 3-9. 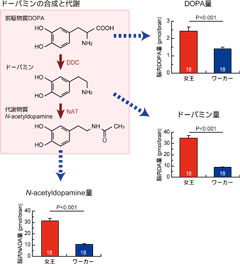 Sasaki K, Matsuyama S, Harano K, Nagao T (2012) Caste differences in dopamine-related substances and dopamine supply in the brains of honeybees (Apis mellifera L.). Gen Comp Endocrinol 178: 46-53.